Do you remember playing with dinosaur toys when you were little? Maybe you had all of your dinosaurs have a battle royale, where the last dino standing reigned supreme. Maybe you gazed at dinosaurs on tv shows and movies. Maybe you even pretended that you were a dinosaur! Yes, there’s a moment in every kid’s life where dinosaurs are the coolest thing in the world and you start having dreams of growing up to become an archaeologist (just to set the record straight here, paleontologists deal with dinosaurs, not archaeologists), so you can study the fossils of these magnificent beasts. Of course, then you grow up and you lose touch with that child, who dreamed of dinosaurs and fossils oh so long ago. You get a job and you forget how to play with your tyrannosaurus rex toy. You forget how to roar like a dinosaur and you head off to a job that has nothing to do with dinosaurs (unless you actually grew up to be a paleontologist, in which case kudos to you for following your dreams). But what if there was some sort of amazing costume that would allow you to relive some of those dreams? Well, there is! 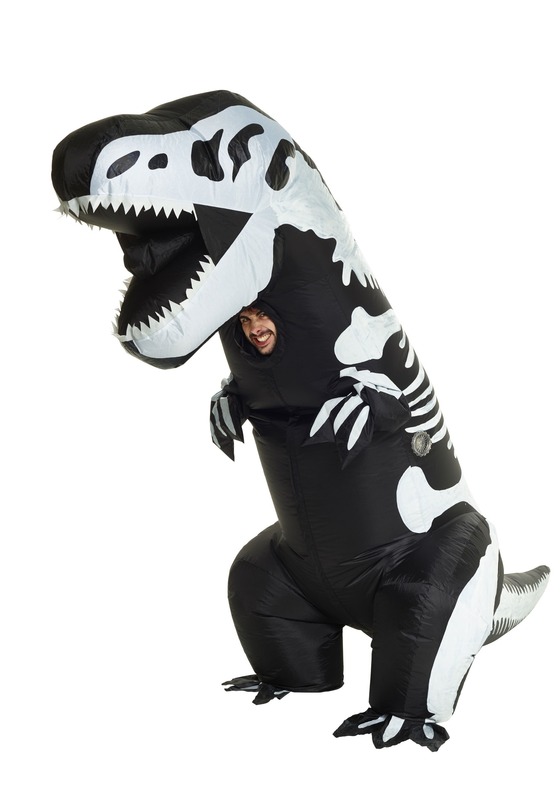 This inflatable skeleton t-rex costume helps you become the ancient dinosaur in a fossilized form. The costume comes with a full-body suit that has a dinosaur skeleton printed on the exterior. It inflates with a battery-operated air fan that’s attached to the outfit. Just flip it on and your costume will inflate, making you look like a freshly dug up dinosaur skeleton. You’ll have the chance to taste the dreams of your childhood all over again when you wear… or at the very least you can create some wacky videos to put on the internet while you wear it.